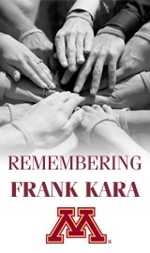 The 2015 and 2016 recipient of the Always Dreaming Scholarship inspired by Frank Kara is Jon Christenson, senior offensive linemen on the Golden Gopher football team. Jon is the first 2-time winner of the Always Dreaming Scholarship. Jon was also awarded the Williams Legacy Award. His story exemplifies how an athletic scholarship can transform a life. 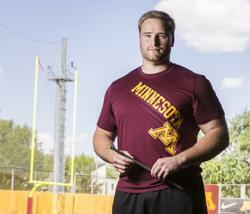 He joined the Gopher football team as a walk-on, paying his own way through school. After two seasons in the program and earning a starting spot on the team, Jon was down to his last $200 and faced with the possibility of quitting football, leaving school or both. That scenario changed drastically when Head Coach Jerry Kill awarded him a scholarship. Not only has Jon continued to contribute on the field since then, he has made the most of the opportunity academically. He already has a degree in Biochemistry -- with a minor in Chemistry -- and is now working on a master's in Public Health Administration and Policy. "I thank the University for these incredible opportunities, these challenges that build character and these amazing experiences that we get to go out and have as student-athletes. It's unbelievable," said Jon. "I want to thank the donors for all that you do [and] for allowing dreams like mine to become reality. We couldn't do this without you and we're so thankful."